From April 9th – May 2nd, 2019, Doctor Tran Minh Hoang from France will directly provide consultation and treatment for patients with eye diseases at FV Hospital’s Ophthalmology & Refractive Surgery Department. 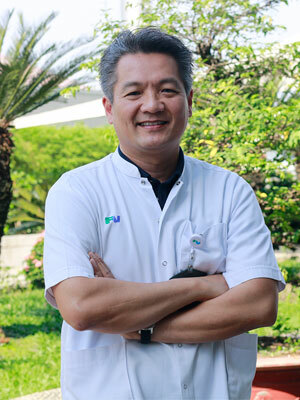 Having held the position of Head of FV Hospital’s Ophthalmology & Refractive Surgery Department (2005 – 2012) previously, and later living and working in France, Dr Hoang has returned to FV with many advanced techniques in the treatment for eye diseases. This gives patients at FV the opportunity for such eye conditions to be cured without the financial costs of finding treatment abroad. Graduated from Henri Poincare University (France), Dr Tran Minh Hoang has 16 years’ experience in refractive surgery, cataract, glaucoma surgery, eye plastic surgery and treatment of strabismus. He has also taken many in-depth studies related to ophthalmology, inflammation and eye infections, retinal images and macular treatment. FV’s Ophthalmologists & Refractive Surgery Department specializes in providing consultation, diagnosis and treatment for eye diseases with a team of well-trained, professional and experienced doctors. In terms of complicated cases, FV doctors will consult with world leading experts to determine the best treatment plans for patients. To arrange an appointment with Dr Tran Minh Hoang, please contact: (028) 54 11 33 33 – Ext: 1107.